thanx! nice to cya 2! Perpetuate is the word which has just come to my mind. Chocolate, Sweets and Sea are the other words I am using on this turn. Hello, my friend! Where have you been? achievement and accomplishment are the words for the fact that I have more than 1000 posts in the Games section, where I participate for the fun and because it is very interesting. probably Terraria, but i kind of got sick of it. maybe the endless amount of youtube and south park i "had to" watch every day. 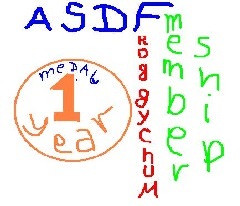 Positive is the word, let us say, for the thing which will happen, if you take part in ASDF every day again. I really hope that this positive thing will happen . Encouragement is another word, liked by me, which I came up with for this game. i will be here from now on! My words: asdf asdf asdf asdf! i had a lot of nightmares tonight and woke up early too. Games, Games, Games, Games ! thanks, but i'm fine, nightmares normally make me laugh rather than be scared. I like making fun of them, and telling them they are stupid. seclusion is the word for something I like living in. Waffle is a tasty word I have not used before. Also, Games and again Games s ! i really want to be the one to get ASDF #100... i've put a lot of effort into it (many posts full of asdf), and I am hoping that you will let me get it , friend. Fig, Fig; Sea - the words for this turn. thank you very much Ivo! I can finally reach this goal! oh man that was awesome. okay from now on i will do new words. Corresponding is a word which I like. Blue and Yellow - the words to avoid the number, which equals 1+1 . Eternal is a word to describe the frogsmileship, as you called it in another game. and yes frogsmileship is eternal! Praising (something which I consider very good).